I was reading through my roster of food blogs the other day when I came upon a recipe for Cadbury Creme Egg Muffins at Baking Bites. 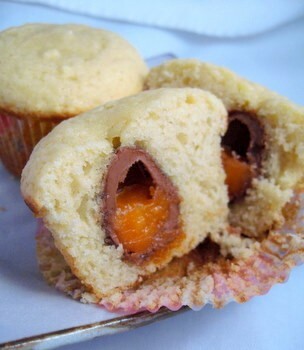 These are muffins with mini Cadbury Creme Eggs baked in the centers! I have to say it is totally ingenious to use a muffin recipe. After all, Cadbury Creme Eggs are about as sweet and sugary as you can get, so the pairing of the sweet candy eggs with a nice vanilla muffin is ideal. If you want to make something extra special this Easter, I bet this would be an awesome treat! Preheat oven to 350F. Line a 12-cup muffin tin with paper liners. In a large mixing bowl, whisk together flour, baking powder, and salt. In a small mixing bowl, whisk together sugar, eggs, melted butter, and vanilla until smooth. Whisk in milk. Pour wet ingredients into dry ingredients and stir until just combined and no streaks of flour remain. Evenly distribute muffin batter into prepared pan. Place 1 mini Cadbury Creme Egg in the center of each muffin. You can use a small knife to pull a bit of batter over the top of the muffin, if you like. Bake for 14-16 minutes, until the top of the muffin springs back when lightly pressed and the edges are a light gold. Be inventive and try using different candies! This is also a great way to use up leftover Easter candy (last year I made a cake with leftover Easter candy, and I have to say it was really delicious!). So, bake away, and Happy Easter! hm. I do love learning how to bake with candy, but these muffins look a little oddly dry – maybe because of the effect of the heat on the caramel! That egg got hollower fast! But i would like the recipe for making gummy bears.